This project page serves as a central place for model information and source code. 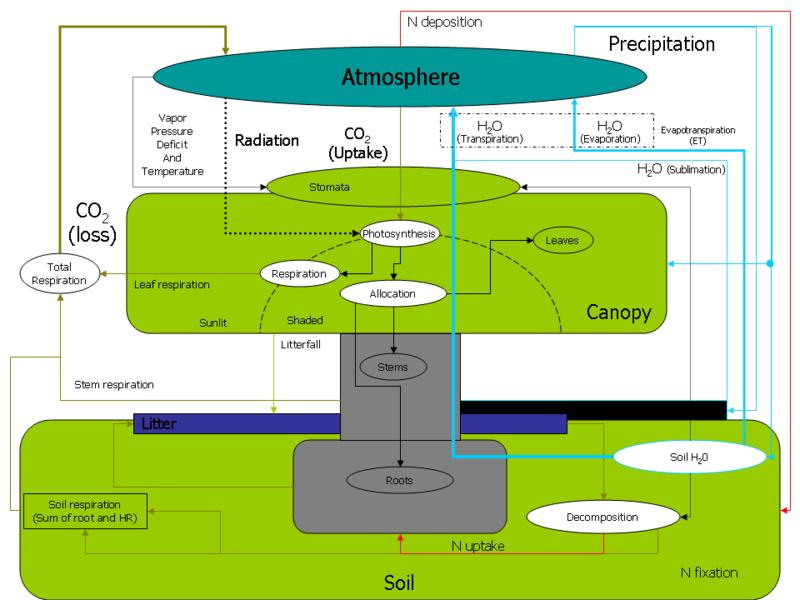 Biome-BGC is an ecosystem process model that estimates storage and flux of carbon, nitrogen and water. Biome-BGC is a computer program that estimates fluxes and storage of energy, water, carbon, and nitrogen for the vegetation and soil components of terrestrial ecosystems. The model uses a daily time-step. This means that each flux is estimated for a one-day period. Between days, the program updates its memory of the mass stored in different components of the vegetation, litter, and soil. Weather is the most important control on vegetation processes. Flux estimates in Biome-BGC depend strongly on daily weather conditions. Model behavior over time depends on the history of these weather conditions, the climate. The primary driving variables for estimating ecosystem processes with Biome-BGC are daily meteorological data. One of the main premises of the Biome-BGC logic is that if we can adequately describe the dependence of key processes on environmental factors related to daily meteorology, then we can estimate these processes anywhere that daily meteorological data are available. In many cases, the only data available for a particular site are the daily maximum and minimum temperatures, and the daily total precipitation. We have developed simple and accurate algorithms to estimate the radiation and humidity parameters when they are missing (see our MT-CLIM page). In other cases, we are interested in performing simulations at a site that has no meteorological measurements at all. In this case, if there is a nearby weather station, perhaps at a different elevation, then MT-CLIM is used to estimate the site meteorology. Often there is not a station very nearby, or there are two or more neighboring stations that might be used to estimate the daily meteorological parameters for the site. In that case it may be necessary to interpolate between individual stations, and possibley extrapolate to a different elevation. This is often the case when we perform gridded Biome-BGC simulations over large regions. We have developed a sophisticated set of algorithms to treat this problem (see our Daymet page). We have been hard at work compiling a list of bug fixes and model enhancments into a new version of Biome-BGC. We are offereing this new beta model version under the downloads section of this site. We have been hard at working compiling a list of bug fixes and model enhancments into a new version of Biome-BGC. We are offereing this new beta model version under the downloads section of this site. This new version has a number of minor bug fixes and some increased functionality. The following is a list of relavant changes to this version. Development Notes for Biome BGC. This file is a list of code/internal changes. Fixed Spin & Go so that the '-g' flag actually works. IMPORTANT Corrected use of the co2 file. It now correctly looks up the value for the model year. Previously it simply used co2 entries starting at the top of the co2 file. Added External Nitrogen Deposition File see USAGE.TXT for more information. a. Added command line option support using getopts() to add functionality without breaking backwards compatibility. See USAGE.TXT for options. b. Centralized header files bgc.h for libbgc pointbgc.h for pointbgc C source files now only need to include one header, all others get included automatically in the correct order. c. Added bgc_io.c for non-data I/O. Replaced all printf()s to stdout with the new wrapper function bgc_printf(). VERBOSITY is one of several defined keywords. You use the keyword appropriate to when your message should be printed. bgc_printf also supports logging functionality see USAGE.TXT for usage. Added code to improve portability and standards compliance. Added 'make tools' to master makefile. This builds the restart diff/view tool. Added 'spin-n-go' functionality. This mode '-g' flag will run both the model and the spinup without generating the restart file.